So why didn’t I go ahead and start to draft the book? Because I realized clearly that I didn’t possess the literary finesse to pull it off. But even while I was floundering around, not at all certain that I would be able to survive as a young novelist, I remained essentially optimistic. Someday, I vowed, I will write the drowning novel. With the appearance of the trunk, the time has finally come to begin work on the novel, and Choko sets off for Shikoku to visit the family home once more. However, it’s fair to say that things don’t go as planned. The trunk doesn’t have the documents he needs, something his sister and late mother suspected all along. Disappointed, he returns to Tokyo where things suddenly fall apart. Kogito has a major argument with Akari, his mentally-disabled son, and before he can make things right, he is struck down by illness. Recovering slowly at home, the writer senses that he may be gradually approaching the end, not just of his career, but also of his life. Does he have time to resolve his unfinished affairs? The over-arching theme of Death by Water is of a writer desperate to create a late-career classic, so it is only fitting in this meta-fictional world that this is exactly what Ōe has achieved with his novel. The slow, innocuous start belies the complexity of what is to unfold, a story spanning a whole life (and others before). Ōe focuses on his country’s dark history, intertwining his own family background with that of Japan, before turning towards an examination of gender issues and the way women and war are inextricably linked on both a local and national level. Large parts of Death by Water take place at Choko’s family home on Shikoku. For anyone who has read his early novel The Silent Cry, Ōe’s description of the house, located in the middle of the woods, will be very familiar. There are also echoes of the earlier book in The Caveman Group, a self-sufficient theatre troupe planning an adaptation of the writer’s final book when it’s completed. In the vaguely militaristic way the group organises its activities, we see the heirs of the bored youths looking for a project in The Silent Cry, but also of the frustrated locals during the war wondering what they can do to halt their country’s decline. These accounts have the effect of stripping the mystique surrounding the deceased, disillusioning the writer. Just what kind of man was his father, really? Has Choko been chasing a ghost all along? This personal disappointment is eventually put to one side, though, as the story takes on a wider, more political slant. One strand to the plot is of the menace of the right, with Choko senior’s crazed war-time plot to kill the Emperor merging into more contemporary concerns. As Unaiko continues work on her recreation of a local feminist uprising, it becomes clear that the hard-line nationalists are still influential, willing to get their hands dirty to defend their values. 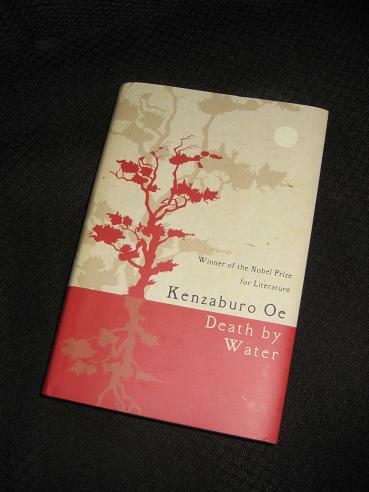 While these gender and culture struggles dominate the second half of the book, though, Death by Water is still very much a reworking and reimagining of Ōe’s own life: as a writer (several of Ōe’s own books are attributed to Choko); as father to a musically-gifted, mentally-impaired son; and as the brother-in-law of a film-maker who committed suicide. Choko is a writer preparing for death and starting to wonder what his legacy is, how he is seen. Throughout the book, I found myself grasping to pull together allusions, constantly wishing I’d read all of his books, as Ōe borrows freely from his entire oeuvre. In fact, this is Choko’s fifth outing (with a sixth recently appearing in Japanese), and while Anglophone readers can try his first outing (The Changeling), as yet the remaining books have not been translated – which is rather annoying. I have to say this is a book I did not get at all. I read it before it came out here last fall and was so underwhelmed I did not write about it. I figured it had to be me, I don’t seem to get on with much contemporary Japanese lit. Joe – J-Lit can be like that; I’ve had many people say they don’t like it. This is definitely a book where the more you’ve put in, in terms of Oe’s previous work (and J-Lit in general), the more you’ll get out. Also, the links between male aggression, right-wing politics and the war is very well done, with Oe tying it all together in the shape of Unaiko. Stu – I’m very keen to read more of his now (I have a couple on the shelves, and I plan to get more…). Definitely important to have an overview of his work to fully get this. Nice review, Tony! I love how thorough you are in your reflections on what you’ve read. It sounds like you’ve read quite a bit of Japanese literature, and correct me if I’m wrong, but a number of Japanese authors tend to borrow from their own works, yes? Or did I imagine that…? I’m trying to remember 🙂 I think it’s interested and a great way of world building that I appreciate in a lot of sci-fi books. Grab the Lapels – Yes, my personal J-Lit library is well into three figures now 🙂 Not only do Japanese writers traditionally borrow from their own works, they also write about themselves very often, albeit in a slightly disguised manner. It’s a tradition going back in the modern era to some of the first Japanese writers, and it may even have a basis in classical Japanese writing (not sure about that, though). Wow, thanks! I just had a hunch based on the small number of Japanese lit books I’ve read. Not a writer I have read – presumably better to begin with his earlier work? Grant – ‘The Silent Cry’ is a good one to start with, or possibly ‘A Personal Matter’. Whatever you choose, if you read enough, you’ll see the themes repeated (à la Modiano).